before running build.sh; it will save a lot of re-cloning of the edk2 tree. You can also do this for FatPkg, but it’s tiny by comparison and not updated by the build scripts. A note on the tree format: the Intel supplied Quark_EDKII is a bit of a mess: one of the requirements for the edk2 build system is that some files have to have dos line endings and some have to have unix. Someone edited the Quark_EDKII less than carefully and the result is a lot of files where emacs shows splatterings of ^M, which annoys me incredibly so I’ve sanitised the files to be all dos or all unix line endings before importing. A final note on the payload: for the purposes of UEFI testing, it doesn’t matter and it’s another set of code to download if you want the Arduino payload, so the layout in my build just adds the EFI Shell as the payload for easy building. The Arduino sections are commented out in the layout file, so you can build your own Arduino payload if you want (as long as you have the necessary binaries). Also, I’m building for Galileo Kips Bay D … if you have a gen 2, you need to fix the platform-data.ini file. xterm -fn vga -geometry 80x25 +u8 -kt sco -k8 -xrm "*backarrowKeyIsErase: false"
And all the function keys work. The Quark build environment comes with a SECURE_LD mode, which, at first sight, does look like secure boot. However, what it builds is a cryptographic verification system for the firmware payloads (and disables the shell for good measure). There is also an undocumented SECURE_BOOT build define instead; unfortunately this doesn’t even build (it craps out trying to add a firmware menu: the Quark is embedded and embedded don’t have firmware menus). Once this is fixed, the image will build but it won’t boot properly. The first thing to discover is that ASSERT() fails silently on this platform. Why? Well if you turn on noisy assert, which prints the file and line of the failure, you’ll find that the addition of all these strings make the firmware volumes too big to fit into their assigned spaces … Bummer. However printing nothing is incredibly useless for debugging, so just add a simple print to let you know when ASSERT() failure is hit. It turns out there are a bunch of wrong asserts, including one put in deliberately by intel to prevent secure boot from working because they haven’t tested it. Once you get rid of these, it boots and mostly works. Mostly because there’s one problem: authenticating by enrolled binary hashes mostly fails. Why is this? 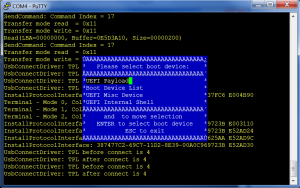 Well, it turns out to be a weakness in the Authenticode spec which UEFI secure boot relies on. The spec is unclear on padding and alignment requirements (among a lot of other things; after all, why write a clear spec when there’s only going to be one implementation … ?). In the old days, when we used crcs, padding didn’t really matter because additional zeros didn’t affect the checksum but in these days of cryptographic hashes, it does matter. The problem is that the signature block appended to the EFI binary has an eight byte alignment. If you add zeros at the end to achieve this, those zeros become part of the hash. That means you have to hash IA32 binaries as if those padded zeros existed otherwise the hash is different for signed and unsigned binaries. X86-64 binaries seem to be mostly aligned, so this isn’t noticeable for them. This problem is currently inherent in edk2, so it needs patching manually in the edk2 tree to get this working. With this commit, the Quark build system finally builds a working secure boot image. All you need to do is download the ia32 efitools (version 1.5.2 or newer — turns out I also didn’t compute hashes correctly) to an sd card and you’re ready to play. I’m going to get into trouble for this, so the reason I think windows is behind the times is that it hard codes uc16 (the two byte glyph format). Linux uses UTF-8 expanding to uc32 (a 4 byte glyph format). Even at the time Windows picked uc16, it should have been obvious that all the fonts for all the languages in all the world would require more than 65,535 glyphs. Now I’d like to claim Linux was forward looking in this, but I fear the sad reality is that someone somewhere wanted cat of a file in an xterm to return their Klingon text and there was a danger that Klingon wouldn’t make uc16. For the philosophically minded there is a nice lesson in diversity here: a diverse ecosystem generally does the right thing, not because it contains people with foresight who predict the future, but because it’s the only way to satisfy all the competing interests. 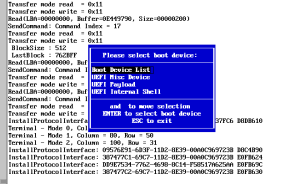 This entry was posted in Embedded, UEFI, UEFI Secure Boot on 27 January 2015 by jejb.